A town where proud knights are raised, where even ambitions to control the skies are swallowed by delusion. 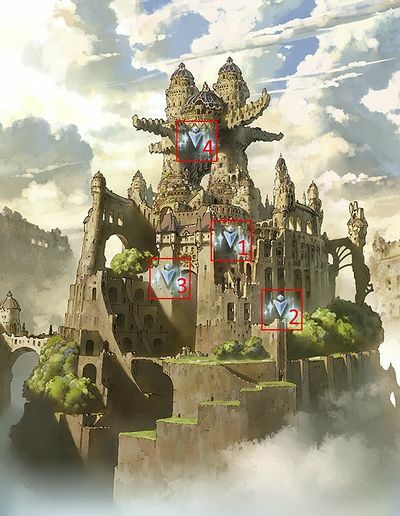 Albion Citadel is the location for chapters 17-20 of the main quest. A citadel that is home to a prestigious military academy. Originally built by the Astrals, it has become a city centered entirely around its learning institution. With traditions such as battle training with live monsters and Lord Commander selection through competitive fighting events, the culture may seem a bit eccentric. However, their superior academy graduates excel in their fields working for various countries and military organizations. 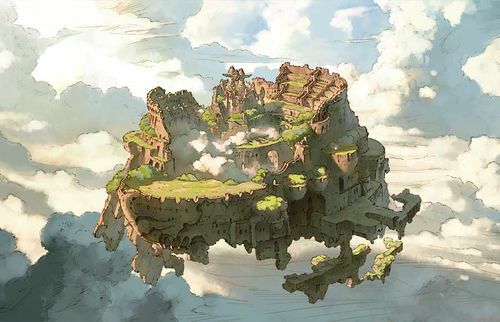 A fortress city created by the Astrals, though currently its society is centered around the military academy. They advocate ruling by force, and choose the next Lord Commander through an Albion-wide gladiatorial contest. This military command post is located at the center of the Albion citadel. The Lord Commander's office is located here, as are the quarters for noble guests and other visitors. The lower levels of the castle house the military academy. The town of Albion surrounds the castle, and makes up much of the citadel. Ferocious beasts are allowed to roam through the town in order to keep the populace alert and fit. People lacking confidence in their skills require a guard. Though the Albion Citadel is man-made, some parts are home to wild plants. Over many, many years, seeds have drifted on the winds and taken root in Albion. The outer limits of Albion, a fortress metropolis. The castle, the city's symbol, peeks through the breaks in the clouds. The main part of Albion, a fortress metropolis. Foul monsters swagger down the narrow streets. Location: Chapter 18: Albion Citadel - Town of Albion Start QuestNetwork Errors will appear if the hosting conditions are not met. Located in the center of Albion. Its figure symbolizes the power of the Lord Commander. Cost to Host: 50 AP Unlock: Rank 50+, Obtain Gisla and increase its level to 100. Cost to Host: 50 AP Unlock: Rank 50+, Obtain Vegalta and increase its level to 100. A state-of-the-art ship that is the Erste Empire's pride and joy. It spreads the Empire's might and terror. Location: Chapter 20: Albion Citadel - Erste Empire Battleship Start QuestNetwork Errors will appear if the hosting conditions are not met. Large Light attack to one ally. Large Light damage to one ally. Wind Damage Cut., and heals itself for 100,000.
on all allies. Heals Odin for 100,000.
on all allies. Removes all buffs from all allies. Knock out its target on the next turn and heal Odin for ~500,000. Base charge diamonds change to ◇◇◇. Several of the Light element drops have not been confirmed by wiki staff. In True Power: Each hit has a chance to inflict Lethal HitInstant death for the victim. ; Damage increased to ~7000 per hit. Only Luminiera Omega must be killed to complete the raid. Gains immunity to PetrifiedStops enemy's charge diamonds from filling. 15-hit Light damage to random allies. , Lethal HitInstant death for the victim. 500 static Light damage to all allies. Has extremely high defense (roughly 95% damage reduction). First clear: Lvl Cap +1 for Luminiera Sword Omega, Luminiera Bhuj Omega, Luminiera Bolt Omega and Luminiera Harp Omega. Killing the middle Primal Bit is the key to this battle. Once the threat of Unknighted triggers is gone, you actually don't take much damage until the end. The best way to kill the bottom bit is through Chain Burst damage from unleashing Charge Attacks on the other enemies. It's not that important to kill this bit but the field effect can be annoying. Aegis Merge Divido is local, so you may dispel your own instance of the buff and keep attacking without worrying about someone surprising you with a new trigger. New triggers will still wipe all of her debuffs, however, so hold debuffs if you think someone is going to wipe them. It is safe to debuff under 60%, as Aegis Merge Divido will no longer trigger when a new player attacks. Once Lumi gets under 25%, she'll start triple attacking for up to 4400 damage per hit. Wait for everyone to trigger this Merge and Attack debuffs to land or you risk a character being triple-attacked to death. Loses immunity to Lethal HitInstant death for the victim. This page was last modified on 17 March 2019, at 18:20.